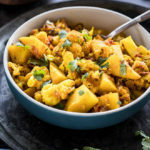 Instant Pot Aloo Gobi – a simple yet classic Indian dish in which potatoes and cauliflower are cooked together with spices. Everyone has their own way of making aloo gobi, but this one is my personal favorite- with lots of ginger, garlic and tomatoes. 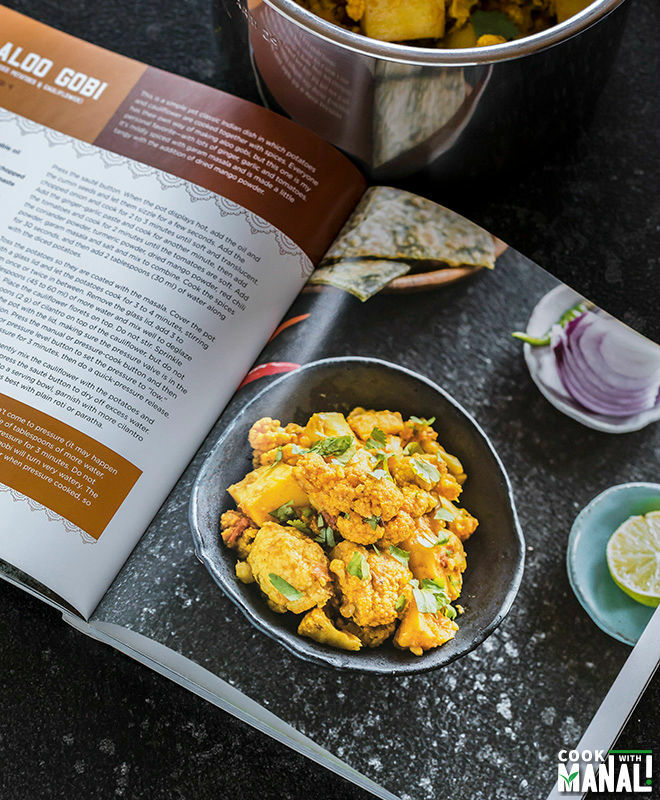 This Instant Pot Aloo Gobi Recipe is from my cookbook Vegetarian Indian Cooking With Your Instant Pot. How was your Thanksgiving guys? I can’t believe the long weekend that I was so looking forward to is already over. I did a lot of shopping on black friday this year – bags, shoes, jackets you name it! We didn’t really plan on shopping anything but it just happened and honestly we had fun. Rest of the weekend, we spent cleaning the house and just donating a bunch of stuff. Now back to the grind and simple, healthy recipes. 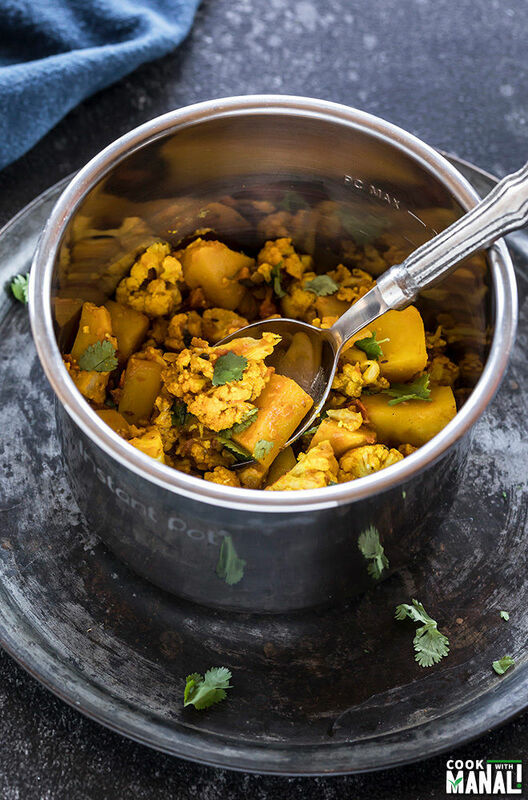 This Instant Pot Aloo Gobi is one of my favorite recipes from my cookbook. It takes little time to put together and is such a comforting dish. Honestly, this recipe was the one that took me most number of trails to get it correct for my book. 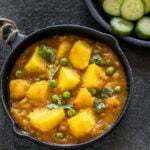 Now, you may wonder why because my stove-top aloo gobi is one of the most popular recipes on the blog and I make it all the time so the Instant Pot version should be just as easy for me. Right? But it wasn’t! Every time I made it, the cauliflower turned into a mush. Sometimes there was too much water, other times I just pressure cooked it for a very long time. So after lot of trials, I finally landed up with this recipe which in my opinion makes the perfect aloo gobi in the Instant Pot. 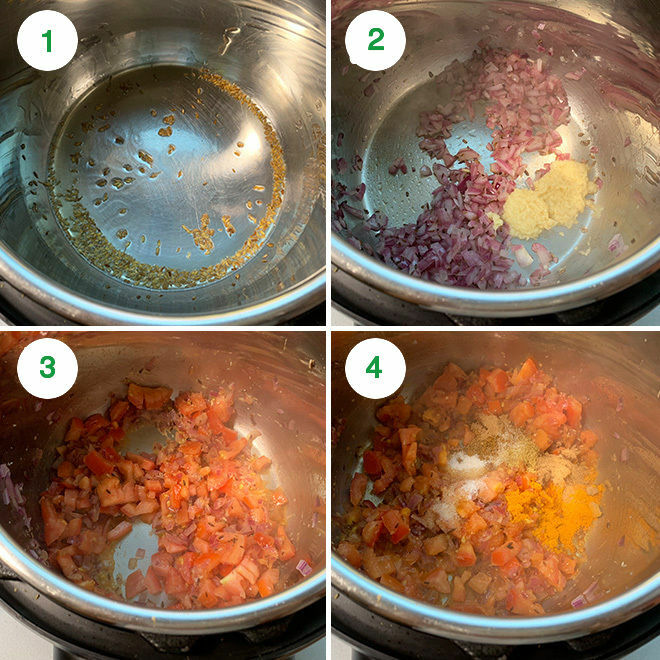 The process is pretty basic- you start with sauteing onion and tomatoes and then add the potatoes, cauliflower along with some basic Indian spices and pressure cook it. But what may seem easy might not be that easy in practice! Like, I mentioned above, every time I made aloo gobi in the IP, it just turned mush. So how did I come up with the right recipe for my cookbook? And voila, you have made the perfect Aloo Gobi, all done in your Instant Pot! For me, the texture of aloo gobi is very important. Yes, we are pressure cooking the sabzi but that doesn’t mean that I should be eating totally mushed up veggies in the name of food. 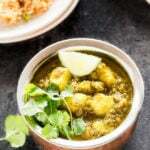 If you feel same as me, then you would love this instant pot aloo gobi. Because though it gets pressure cooked, the veggies retain their texture! What If The Pot Doesn’t Come To Pressure? The most important thing to keep in mind is to deglaze the pot. After the potatoes are cooked for few minutes on saute mode, you add water before adding the cauliflower florets on top. So, before you add the cauliflower, make sure to deglaze the pot as you add the water. There should be no burnt bits at the bottom of the pot. If there are, it won’t come to pressure since we are not adding ton of water here. Remember that it takes around 8 to 10 minutes for the pot to come to pressure in this recipe. So don’t try to open the pot to check what’s going on if it doesn’t come to pressure. Wait for 8 to 10 minutes for the pot to come to pressure. If it doesn’t come to pressure even after that time or shows Burn message, open the pot, add couple of tablespoons more water and try again. You don’t need a lot of water here so don’t be tempted to add more than what is needed. Some people have had problems while making this dish in 8qt and the newer IP models. These models are prone to giving BURN messages. So if you have a 8 qt, add extra 1/4 cup water. It has a bigger surface area and thus might need more water. I have not tested this recipe in a 8qt so I really can’t comment how much more water it would need. But I would say go with extra 1/4 cup. This Instant Pot Aloo Gobi Recipe makes a simple and delicious meal, just like how it was made in my home in India. I love to eat it with warm rotis! 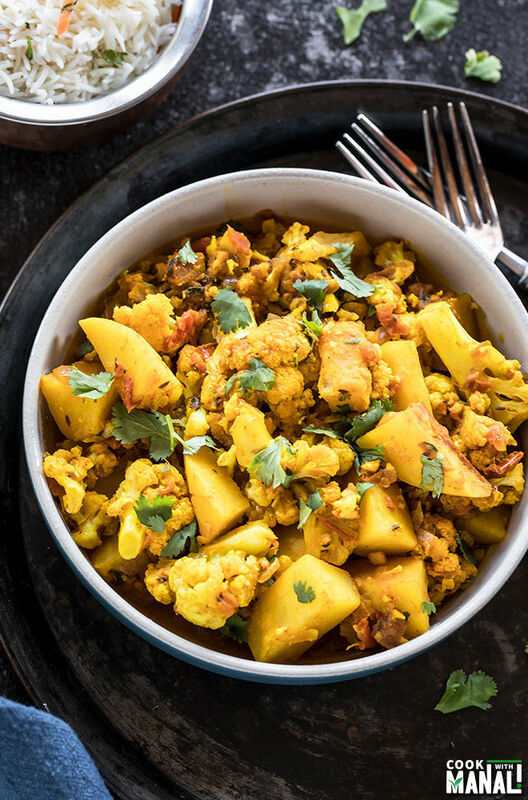 Just like almost every aloo gobi recipe is, this instant pot aloo gobi is also vegan and gluten-free. 1- Press the saute button on the Instant Pot. Once it displays hot, add oil to the pot and then add the cumin seeds. Let the seeds sizzle for few seconds. 2- Then add the chopped onion and cook for 2 to 3 minutes until the onions are soft and translucent. Add the ginger-garlic paste and cook for another minute. 3- Add the chopped tomatoes, stir and cook for 2 minutes until soft. 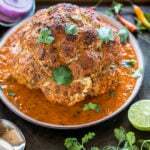 4- Then add in all the spices – coriander powder, turmeric powder, amchur (dried mango powder), red chili powder, garam masala and salt and mix. Cook the spices for 30 seconds. 5- Stir in the diced potatoes along with 2 tablespoons water. Cover the pot with a glass lid and let the potatoes cook for around 3 minutes. You may stir them once in between. 6- Remove the glass lid and add around 3 to 4 tablespoons water to the pot and deglaze it. There shouldn’t be any burnt bits at the bottom of the pot. Place the cauliflower florets on top and then sprinkle with chopped cilantro. Do not stir. 7- Close the pot with its lid and press the manual or pressure cook button. Use the adjust or pressure level button to set pressure to “low”. Cook on low pressure for 3 minutes, with the pressure valve in the sealing position. The pot takes around 8 to 10 minutes to come to pressure so be patient. Do not try to open the pot in between and check if it has come to pressure or not – it will! 8- Do a quick pressure release. Open the pot and with a spoon gently mix the cauliflower with rest of the masala and the potatoes. You may press the saute button to dry off any excess water. 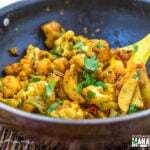 Serve aloo gobi with roti or paratha. Reprinted with permission from Vegetarian Indian Cooking by Manali Singh, Page Street Publishing Co. 2018. 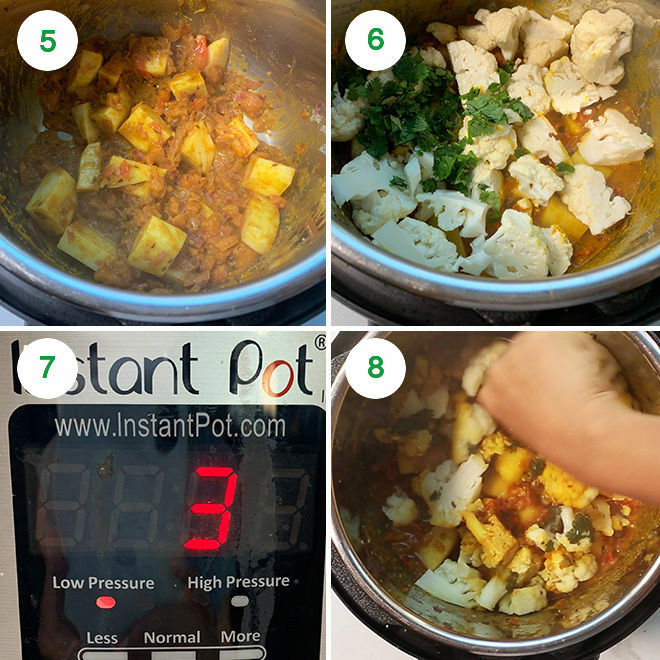 If you’ve tried this Instant Pot Aloo Gobi Recipe then don’t forget to rate the recipe! You can also follow me on Facebook, Instagram to see what’s latest in my kitchen! 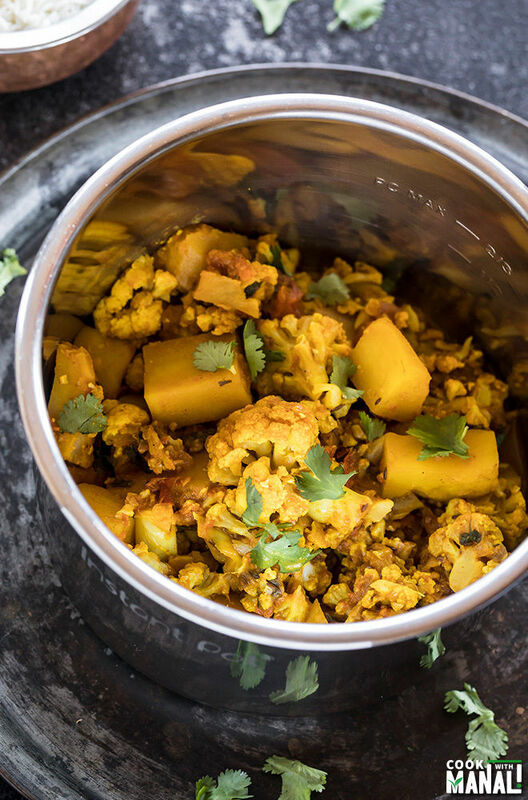 Classic Indian dish, Aloo Gobi made in the Instant Pot! 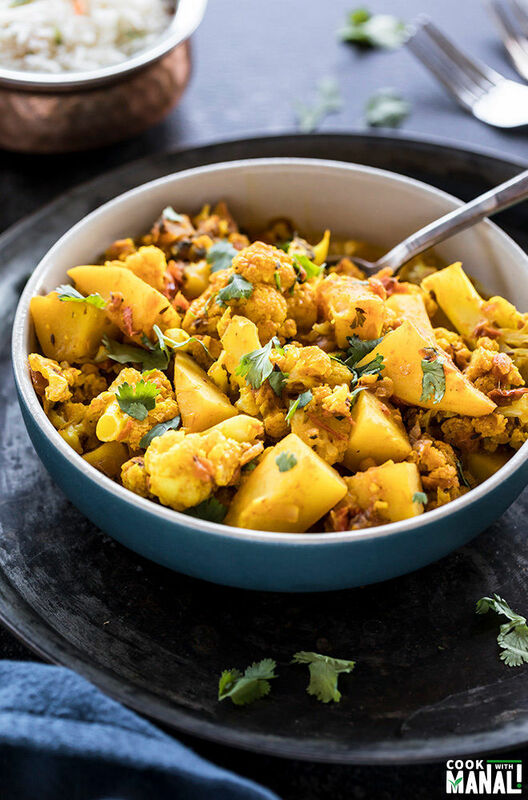 This spiced potatoes and cauliflower dish is vegan, gluten-free and makes a comforting meal. Chop everything before you start. Remember to chop the potatoes and cauliflower in large pieces, as mentioned. Press the saute button on the Instant Pot. Once it displays hot, add oil to the pot and then add the cumin seeds. Let the seeds sizzle for few seconds. Then add the chopped onion and cook for 2 to 3 minutes until onions are soft and translucent. Add the ginger-garlic paste and cook for another minute. Add the chopped tomatoes, stir and cook for 2 minutes until soft. Then add in all the spices - coriander powder, turmeric powder, amchur (dried mango powder), red chili powder, garam masala and salt and mix. Cook the spices for 30 seconds. Stir in the diced potatoes along with 2 tablespoons water. Cover the pot with a glass lid and let the potatoes cook for around 3 minutes. You may stir them once in between. Remove the glass lid and add around 3 to 4 tablespoons water to the pot and deglaze it. There shouldn't be any burnt bits at the bottom of the pot. Place the cauliflower florets on top and then sprinkle with chopped cilantro. Do not stir. Close the pot with its lid and press the manual or pressure cook button. Use the adjust or pressure level button to set pressure to "low". Cook on low pressure for 3 minutes, with the pressure valve in the sealing position. The pot takes around 8 to 10 minutes to come to pressure so be patient. Do not try to open the pot in between and check if it has come to pressure or not - it will! See notes above. Do a quick pressure release. Open the pot and with a spoon gently mix the cauliflower with rest of the masala and the potatoes. 1. In case the pot doesn't come to pressure even after 8-10 minutes, just add a couple of tablespoons of more water and make sure the pot is deglazed and there was no burnt bits at the bottom. 2. Do not add too much water or the aloo gobi will turn very watery. The tomatoes also release water when pressure cooked, so you don't need a lot of water for this recipe. 3. 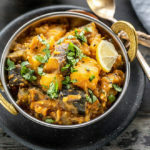 This recipe has been tested several times in the Instant Pot 6Qt DUO. 4. Some people have had problems while making this dish in 8qt and the newer IP models. They are prone to giving the BURN message. So if you have a 8 qt or a newer IP model, add extra 1/4 cup water. It has a bigger surface area and thus might need more water. I have not tested this recipe in a 8qt so I really can't comment how much more water it would need. But I would say go with extra 1/4 cup. And make sure to deglaze properly, there should be nothing stuck at the bottom. I’ve never had a dish like this before. It looks really good! Plus I love potatoes! I’ll have to give this a recipe a try soon, thank you! The amount of water required is not right in the recipe. It caused burn notice! I added the recommended amount of water in the recipe, and even a little more to make sure. After the burn notice, opened the instant pot up and added even more water. Went to pressure cook mode again, only to be greeted with a second burn notice! Please do not use the recipe unless you want burned aloo gobi! Sorry it didn’t work out for you but please don’t ask others to not make it or say this recipe is wrong! This recipe is from my cookbook and I tested it at least 10 times before putting it in my book. I was looking for a dried texture of aloo gobi that’s why I did not want to add a lot lot of water. After a lot of attempts I succeeded in making it perfect for IP! 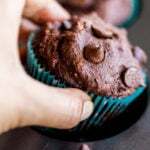 So please don’t call this a wrong recipe. I hope you scraped the bottom as I have mentioned in the recipe, you can see the video as well that i have done for this recipe. Even if you de glaze the pot and still got burn notice then it might be a problem with your IP! A lot of newer models especially 8qt have this burn isssue! A lot of people have successfully made this recipe from my book and I make it all the time too, so I know this works with just the amount of water mentioned in the recipe! The tomatoes also release water when pressure cooked so this recipe doesn’t need a ton of water. I have an 8qt instant pot, and the water amount you provided definitely caused burn notice twice. So, I believe it is important to warn people about it. The spice combination is pretty good though. I followed her instructions EXACTLY (glazed the pot) and I ignored the burn message and the dish came out Amazing. Thanks for your recipe. The most crucial thing in my opinion that will make your recipe even greater, is the quantity of water required. Hello John, this recipe works fine with the amount of water mentioned. 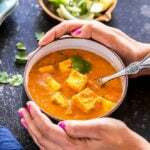 Every recipe in the Instant Pot doesn’t need 1 cup water. A lot of veggies like tomatoes, spinach, radish, cabbage etc. release a lot of wayer when pressure cooked so you have to keep that in mind. We are using tomatoes here, so the water that we add and the water released from tomatoes is enough to bring pot to pressure. If you still want to add 1 cup water so ahead add it but you will end up with a very watery aloo gobi which I don’t like personally. John, the recipe is perfect as it is. I glazed the pot as she suggested but still got burn message. At that point,vi did NOT add water – just ignored the message and let it cook. The results were Amazing. 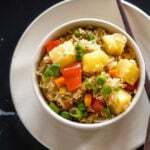 Hi there, I tried this recipe and followed everything exactly, but the Gobi came out mushy. Don’t know where it went wrong. My Gobi pieces were big so I thought it would work. I used a 6qt. Any thoughts? Ok will try 2 minutes next time. I did make sure to keep on low pressure. I’ll keep you updated. Thanks. Can you make this with frozen cauliflower? If so, do you know if it will change the quantity of water? hmm I have never tried with frozen cauliflower..I would follow the exact recipe and see how it goes.. The Nova instapot went into burn status. Had to add water and mix up the potatoes and cauliflower. Low pressure so it was all undercooked. Not great.